Wahid Sali - Exclusive Interview: "Kolkata Is Heaven For Winners"
Olympian TA Rahman is one of the most adored names in Indian Football. Be it in Kerala or in Kolkata, the Olympian is a true footballing superstar in all sense. One of his wards, Wahid Sali has followed his footsteps from his Universal soccer academy to the Green and Maroon brigade. Sali is making quite a name for himself after the opening few matches in I-League as well as in Calcutta Football League. Versatile defender Wahid Sali has made quite a progress from a 7’s footballer to one of the top defenders in I-League. He believes that a player should always look for ways to improve his game and his hardworking nature on and off the pitch is a testament to his statements. TheHardTackle’s resident author Joseph George met him in Kolkata and the duo went through some hot and cold football discussions over a few hours. Joseph George: Was the decision to move to Mohun Bagan an easy one? You had a number of options to choose from including a more lucrative offer from Churchill Brothers. How did you came to the conclusion? Wahid Sali: Even though Churchill Brothers offer was bigger, being the club of Olympian T A Rahman, I chose Mohun Bagan over others. During my early days in Universal Soccer club, Rahman had instilled the dream of playing for Mohun Bagan and it was influential in my decision to choose Kolkata. Joseph George: You will be a proud man afterAi? ?wearing Mohun Bagan shirt following the footsteps of T A Rahman. Can you throw more light on his influence in your career as coach and mentor? Wahid Sali: Itai??i? ?s beyond words. He was a super star of Mohun Bagan. When I came to Universal soccer academy, Olympian wanted to see Mohun Bagan shirt on each of those kids. As a student I am very proud to wear this shirt today. Itai??i? ?s very unfortunate that he is not here to see this today but I am sure that he will be a happy man in heaven. He has modified the person and player in me at a young age which helped me to reach this stage. After the demise of Rahman, his son Haris Rahman, Deepak CM and Ranjith PC has taken over the club and itai??i? ?s one of the shining lights in 7ai??i? ?s football nowadays. Joseph George: Another person who has influenced your career in a big way is Universal Soccer coach Deepak CM. How was your experience with him? Wahid Sali: He was Rahman’s favourite student and the reason was simple. Deepak sir is a person who breathes football and talks football. He works for football without expecting any profit or returns and that makes him someone special. He has a different perspective to all the things in football and thinks out of the box and is someone who taught us to score a penalty by passing the ball into the net! Joseph George: Santosh Kashyap taking over at ONGC had changed the fortunes of the club last season. It also announced your arrival in Indian Football. How did the change in management at ONGC helped the teamai??i? ?s cause? Wahid Sali: He is a playerai??i? ?s coach. He understands each player like his own child and prepares the team based on their strengths. He treats all the players as his friends and they have the freedom to discuss all their concerns to him as well. Without him I wouldnai??i? ?t have made it to I-League and I am very grateful to him. I was lucky enough to be part of the revival under Santhosh Kashyap in ONGC. We had an unbeaten run under him and that changed the fortunes of many footballers including me. Before coming to Mohun Bagan many players had told me that you will not find a coach like him elsewhere and that tells the whole story. Joseph George: How did you adapt to the role of a Mohun Bagan wing back in a 4-3-3 formation? In Mohun Bagan matches, the lack of defensive support from midfielders and wingers are evident. Opponents are targeting this area to open up the Bagan defence. How you are dealing with the situation? Wahid Sali: 4-3-3 is one of the best formations in the modern football world. Coach Karim Bencharifa has given a specific role for each player in this formation, if everyone performs their duties, then we can play some beautiful football. All fit players would love to play in this formation and it will be a matter of time before everything falls in place. Joseph George: Some of the critics has been hunting for your blood since the day you joined Mohun Bagan. Even some rumours spread in between that you will not come back from Kerala when you went for an emergency visit. Pailan Arrows Pritam Kotal was lined up as your replacement as well. Do you feel that there is a group trying hard to make your life worse in Kolkata? Wahid Sali: Before coming to Mohun Bagan I had told the media that, ai?? ?I am a newcomer to I-League and to Kolkata. 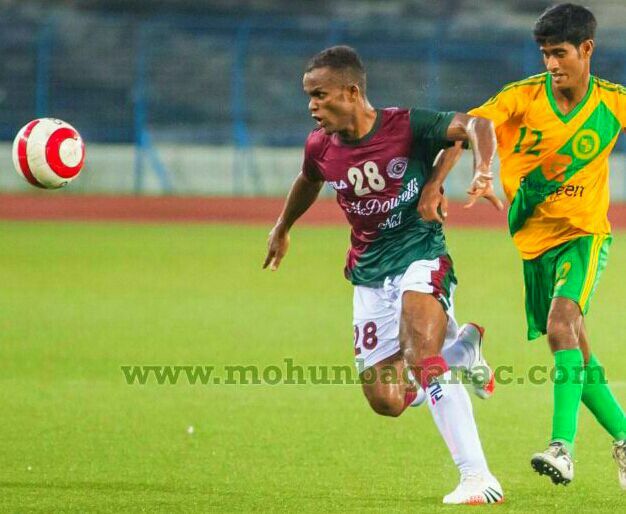 As a player I am still learning my trade, if its from Mohun Bagan it will be good for meai??i??. Coach Karim Bencharifa has been helping me a lot during my difficulties. He is very strict and he points out the mistakes in open. Every player knows that its for their betterment. If a player does something wrong the coach has every right to correct him isnai??i? ?t it. Who should correct the players the coach or the crowd? Joseph George: That display against Churchill Brothers was assuring to say the least. 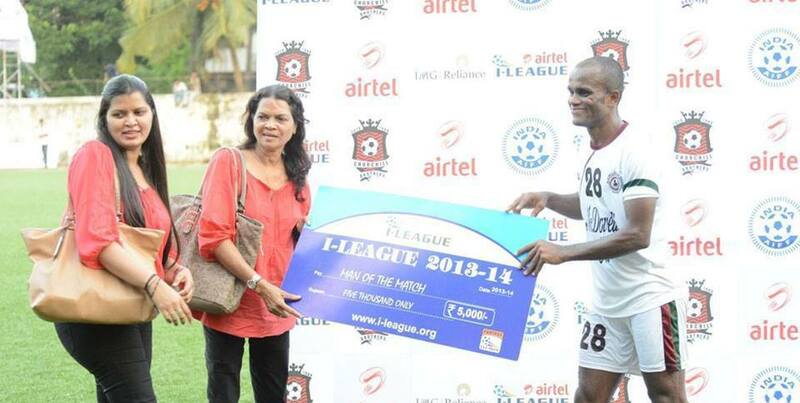 Man of the Match performance in an I-League match between two clubs involved in a battle to get your signature. Do you think it will help to silence your critics? Wahid Sali: Man Of the Match against Churchill Brothers is in the past now. Everybody needs more on future. So leave past..stay present..and focus on future. Joseph George: During your time in ONGC, you were regarded as one of the best defenders in the country. The performance against Churchill Brothers underlines that once again. Do you think itai??i? ?s time to target a spot in Indian Football Team? Wahid Sali: Like every Indian player, I also want to play for India one day. If I can follow the path and instructions set by Coach Karim Bencharifa in Mohun Bagan, I can dream of an Indian Football Team spot like the other youngsters. For the new players in Mohun Bagan, Coach has taught us to dream big and instilled a target to wear Indian colours. In-Sha-Allah, some of us might reach our targets if we can produce the goods on ground. As a player I will be focussing to improve my game at every given opportunity. Joseph George: In a club like Mohun Bagan, coach will be under immense pressure to produce the results. Do you feel that Coach is result oriented and showing that frustration to the players when things arenai??i? ?t falling in place? Wahid Sali: Certainly there is lot of pressure on the coach, but he hasn’t unloaded it on the players. Coach discusses the team matters to the players as well, and we all are responsible for the results produced. Joseph George: Mohun Bagan is struggling for finances at the moment, and the club has failed to meet the players salaries on occassions. On the other hand coach has been very strict and abusive in his methods. So players mental preparations wonai??i? ?t be ideal ahead of some matches. Do you think it is a reason behind some of the bad performances from the team? Wahid Sali: 90% of the Indian Football clubs are in bad financial state at the moment. We are getting our salaries at Mohun Bagan. Coach has been fighting from the front to get the players salaries. Donai??i? ?t you think a coach like him deserves to tell things in the face of under performing players? Joseph George: The presence of players like Denson Devadas, CS Sabeeth, Zakeer MP etc. Might have helped you to adapt to Kolkata easily. How is life in Kolkata? Wahid Sali: For winners Kolkata is a heaven while for losers itai??i? ?s hell. I have started to dream about a heaven here, if Allahu blesses it will become a reality. In-Sha-Allah. Joseph George: What are your views on IMG-Rai??i? ?s IPL styled football league? Will you play in this league if given a chance? Wahid Sali: My desire to play better football at any place. Right now I am focusing on club matches. As a player, I have lot of responsibilities entrusted by Mohun Bagan and I would like perform to the best of my abilities.I am leaving all other things to the club management in this period. Joseph George: Football enjoys tremendous popularity in Kerala. Despite that there is no I-League team from one of the hubs of Indian Football. Why has the state not been able to make significant strides in recent years? Wahid Sali: Like all the Malayalis around the world, I too would like to see an I-League team from Kerala. Many Malayali players are playing for different clubs in I-League. We all would love to see a team from our place. More than sponsors, state government need to step forward to support this initiative. Itai??i? ?s time for us to capitalize on the rich footballing history of our state. Joseph George: 7ai??i? ?s football is quite famous in Kerala. How was your experience in playing 7-a-side matches back home. Does it help players to improve their game? Wahid Sali: In Malabar area, 7ai??i? ?s football has developed a strong sporting culture. There are no barriers of once religion, caste or beliefs. 7ai??i? ?s has provided daily bread to many players including me. There are many innocent football lovers who loves hardworking and dedicated football players. This makes the essence of football. The list of players who emerged from 7ai??i? ?s will be a pretty long one with Eche, Zakeer, Noushad, Anas, Justin, Dhanarajan etc. I am sure that we can expect more players from 7ai??i? ?s field to Indian Football in future as well. 7ai??i? ?s is not just Football, itai??i? ?s a great culture. Memorable Moment : First practice session in Mohun Bagan ground in a Mohun Bagan jersey on July 17th.